The younger sister label of the world famous Abercrombie & Fitch brand, Hollister is a casualwear label that aims to bring the laid-back lifestyle and vibe of California to fashion-conscious women and men worldwide. Launched in 2000, Hollister has developed a reputation for its high quality casualwear which brings together a modern design aesthetic with easy-to-wear fabrics. 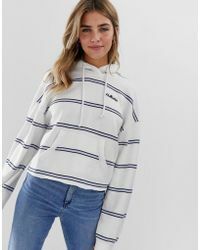 The collection of Hollister sweats includes sweatpants and sweat tops in addition to hoodies, complete with bold slogans and the brand's distinctive logo.